Rental Prices: on request. All rates include VAT, Unlimited mileage, Airport Transfers, Personal Accident Insurance, Full Third Party Insurance, and 85% Comprehensive Insurance. Capacity of tank + jerry can: 110 liters of diesel. Range is approx. 900 km. Capacity of tank + extra tank + jerry can: 160 liters of petrol. Range is approx. 1100 km. Air conditioning, Radio/Tape, Power steering, Keyless entry, 5 speed manual or automatic transmission, Seats 4-5 persons, With lockable canopy. Capacity of tank + extra tank + jerry can: 160 liters of petrol. Range is approx. 1100 km. Air conditioning, Radio/Tape, Power steering, Keyless entry, Built-in air compressor, 12/220V fridge/freezer, built-in luggage drawers, Roll-off shading, Seats 5 persons. Capacity of tank + extra tank + jerry cans: 185 liters of diesel. Range is approx. 1400 km. Luxurious station wagon with automatic transmission, Air conditioning, Radio/CD/Tape, Power steering, Cruise control, Keyless entry, Built-in air compressor, 12/220V fridge/freezer, Roll-off shading, Seats 5 persons. Capacity of tank + extra tank + jerry cans: 230 liters of petrol. Range is approx. 1150 km. Luxurious pick-up with 6 speed manual, Air conditioning, Radio/CD, Power steering, Cruise control, Keyless entry, Seats 4-5 persons, With lockable aluminium canopy. Capacity of tank + extra tank: 140 liters of diesel. Range is approx. 1250 km. Air conditioning, Radio/Tape, Power steering, Air compressor, 12/220V fridge/freezer, Roll-off shading, Seats 4-5 persons. Capacity of tank + jerry cans: 170 liters of diesel. Range is approx. 1400 km. Luxurious station wagon with automatic transmission, Air conditioning, Radio/CD, Power steering, Cruise control, Keyless entry, Seats 4-5 persons. Capacity of tank + jerry cans: 127 liters of petrol. Range is approx. 900 km. Capacity of tank + extra tank + jerry can: 160 liters of petrol. Range is approx. 1000 km. Air conditioning, Radio/Tape, Power steering, Keyless entry, 5 Speed manual or automatic transmission, Seats 4 persons, With lockable canopy - Inclusive camping equipment. Capacity of tank + extra tank + jerry can: 160 liters of petrol. Range is approx. 1000 km. Air conditioning, Radio/Tape, Power steering, Keyless entry, Seats 2 persons, With lockable canopy - Inclusive camping equipment. Capacity of tank + extra tank + jerry can: 160 liters of petrol. Range is approx. 1000 km. Capacity of tank + jerry cans: 130 liters of diesel. Range is approx. 1000 km. Capacity of tank + extra tank + jerry cans: 185 liters of diesel. Range is approx. 1400 km. Capacity of tank + extra tank: 140 liters of diesel. Range is approx. 1250 km. Air conditioning, Radio/Tape, Power steering, Air compressor, 12/220V fridge/freezer, Roll-off shading, Seats 2 persons. 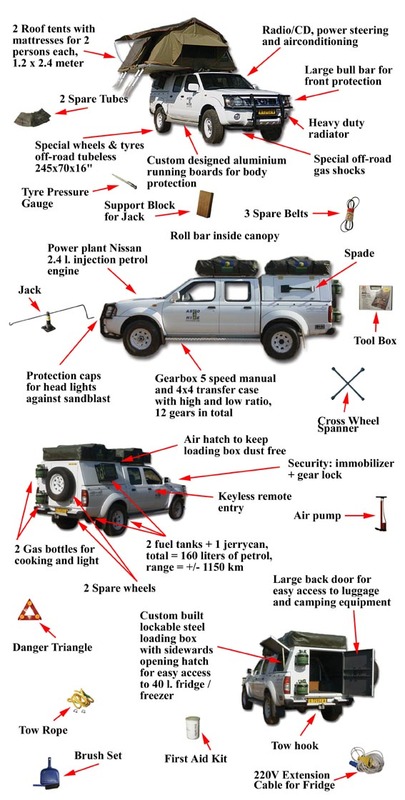 Inclusive camping equipment Capacity of tank + jerry cans: 170 liters of diesel. Range is approx. 1400 km. All our 4x4 vehicles our equipped with Radio/Tape. CD players don't work in Namibia because of dust and shocks & vibrations while driving on gravel and dirt roads. Please note: All rentals start at a minimum of 6 days. We recommend you bring soft bags to store your luggage in while travelling. Hard-shell cases may be difficult or even impossible to fit in some vehicles. The suitcases you don’t need can be stored at our depot during your holiday. Drop off & Pick up of vehicles in a location other than Windhoek is available on request. After arriving from a long and stressful overseas flight, we will meet you at the airport and take you to our Asco offices or your accommodation (within Windhoek) free of charge. This transfer is also valid, should you decide to only collect the vehicle a few days after arriving. When collecting the vehicle, we will explain you the use of the 4x4 in detail. In case you would like your car to be equipped with (a) children-seat(s) -for children 1 to 7 years old- please let us know at the time of booking. We'll be happy to install it for you.